Here's a superb new online slots from Pariplay. It’s the most wonderful time of the year, and if you love Christmas (who doesn’t right?) you will adore this online slot. Great graphics, huge wins and a few surprises along the way – this game will get the festive cheer flowing. Check out our entire list of online slots games now. Pariplay specialise in online instant win, scratch and other fixed odds casino games. Using the latest software their games are easy to get started with and fun to play thanks to excellent graphics. If you love promo's, get the best slots promotions today. I love Christmas doesn’t care if you’ve been naughty or nice, no matter what you’ve been up to this year everyone can win the big prize in this seasonal online slot. Complete with Christmas trees and a snowy backdrop it’s a beautiful game to look at, and even better to play. So its jingle bells all the way and with 5 reels and 25 fixed paylines it’s nice and easy to get the Christmas party started with easily recognisable online slot format and rules. Once you’ve selected your wager it’s time to take a festive spin. As with all online slots, land the right combinations of symbols and the Christmas rewards will begin. If you’re in a rush there’s the autoplay option to hurry things along a bit, but tis the season for relaxing so why not take a leisurely pace. You’ll find lots of classic Christmassy symbols on the reels of I Love Christmas, some more valuable than others. The traditional stripy candy cane, cute ice-skates, tasty gingerbread man, flickering candle and twinkling star will pop up most frequently and they are worth between 4 and 125 credits. The presents you really want under your tree though are the frosty snowman, Christmas stockings, bells and baubles – some of which can credit you a whopping 1,000 credits. Snow Globe – The Snow Globe is the wild card that can substitute for all the basic symbols that we’ve already mentioned. Plus wild combinations can be worth up to 5,000 credits! 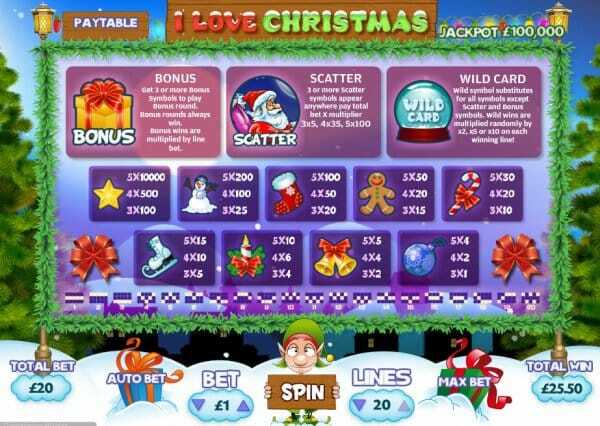 Santa Claus– Santa Claus is the scatter symbol, and when Santa is in town a beautiful Christmas bonus can be triggered. Land 3 or more scatters on the reels anywhere and enjoy up to 30x free spins. Now that’s a present you want to receive any time of the year. Presents - 3 of these on a payline will trigger a bonus game, where the lucky recipient can rip the paper off the presents and bag themselves a big win.